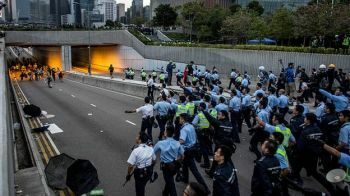 Protesters fought police armed with pepper spray, batons and water hoses on Lung Wo Road in Admiralty..
On Monday, an injunction was granted to clear an area just west of the main Admiralty protest site. That sparked fears of more violence after what was already some of the worst unrest in two months of protests. The protesters want the people of Hong Kong to be allowed to choose their leaders in the 2017 elections without interference from Beijing. The Chinese government has said it will allow universal suffrage, but will screen candidates for the chief executive post in advance. After the clashes, Chief Executive CY Leung warned activists not to come back to the protest site later on Monday. "From this day on, the police will take resolute action when carrying out their duties. I call on the students who are thinking of returning to the occupation area tonight not to do so. "Don't mistake the police tolerance as weakness." The unrest flared late on Sunday, after student protest leaders called on supporters to converge on the offices of Mr Leung on Lung Wo Road. The road is a short distance away from Connaught Road in Admiralty, the major road protesters have been occupying for two months. Protesters, many wearing hard hats and carrying umbrellas - the symbol of their movement - moved into the area, throwing bottles, helmets and umbrellas towards police. "I urge everyone to stay here until the morning to keep surrounding the government headquarters. Let's stop the government from functioning tomorrow," a protester in a black T-shirt shouted, Reuters news agency reported. Police ordered them to retreat, then charged protesters, eventually forcing them out of the area. Police said that 40 people were arrested and a number of officers were injured. On Monday government offices were shut and staff were told to stay home. But the roads outside the government site were clear of protesters and open for traffic. By the afternoon government employees were able to go back to work. The atmosphere remains tense at Connaught Road where hundreds of protesters are still occupying the area amid a police presence. Later on Monday, a coach operating company won a court injunction to clear a section of Connaught Road and Harcourt Road, just west of the main Admiralty protest camp. The site is seen as the major stronghold of protesters and observers say police action to dismantle it could lead to more clashes with protesters. The activists had public support when they started their protest in September, but that is now ebbing as many Hong Kong residents believe the protests are causing too much disruption. Last week, acting on a separate injunction granted to a local business police and court bailiffs removed one of the three major protest camps in the Mong Kok commercial district. More than 100 people - including some key protest leaders - were arrested as the Mong Kok camp, across the harbour from Admiralty, was dismantled. The latest clashes come after China said it would not allow a UK parliamentary committee to enter Hong Kong as part of an inquiry into British relations with its former colony.